The formation of Lake Wallula behind McNary Dam forever altered the original shorelines of the Columbia. The large floods of 1996-1997 deposited over 40 acres of silt, creating the delta we know today. Rank plant and tree growth line the shores of both rivers. An explosion of invasive non-native plants, such as purple loosestrife, phragmites, false indigo, and reed canary grass, threatens to engulf the mudflats of this vitally important delta area. At 340 feet above sea level, this delta is part of an interior desert that gleans just over eight inches of precipitation a year. Summer air temperatures can reach 112 degrees, and winds up to 40mph out of Wallula Gap are possible year around. 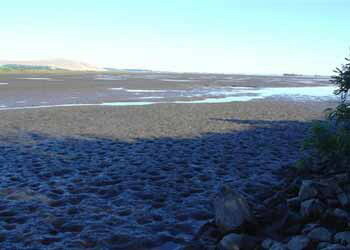 This large invertebrate-rich mudflat is located at the mouth of Wallula Gap, where the Columbia River makes its big bend to the west and the Pacific Ocean. During fall migration tens of thousands of birds utilize the Columbia River corridor as a migration route out of Canada. Many are forced down by high winds or weather, to rest, recoup, and feed. Most see the delta as an oasis in a huge monocultural desert of dry-land wheat farms. This delta has hosted huge numbers of common species over the years. Take 21,000 Northern Pintails, 3,800 Green-winged Teal, 15,000 gulls, 8,000 American Wigeon, 2,500 Western Sandpipers, thousands of Vaux's Swifts in migration, and much more. Many rare species have appeared here, such as Sharp-tailed Sandpiper, Ruddy Turnstone, Hudsonian Godwit, Gargany, Steller's Eider, Long-tailed Jaeger, Parasitic Jaeger, Ruff, Lesser Black-backed Gull, Sabine's Gull, and Prairie Warbler. This area is a shorebird paradise when water levels are low, with up to 16 species observed in one day. Mid-June through early October is best for the numerous fall migrants and shorebirds. Winter is best for gulls. Terns, pelicans, and waterfowl congregate here in the spring. Every season presents an outstanding new array of species to see and watch for. Merlin, Peregrine, Prairie Falcons, Northern Harrier, and Bald Eagles hunt this delta. This is an area used by human hunters as well, from mid-October through January. Warnings: This site hosts ticks in April and early May, a few western rattlesnakes during the warm summer months and ground-nesting yellow jackets from late summer on into the fall. During summer and fall, there will be yellow-star thistle thorns to contemplate. These thorns are nearly an inch long and will puncture even the thickest-skinned birder, so long pants are advised. In winter, ice may form on the delta and out over the Columbia River. It is not a good idea to traverse this ice! Also you may be crossing the Union Pacific Rails, use caution on these tracks. Trains come through, sometimes at high speeds. They do not stop. Please use common sense, and enjoy this very special birding area.